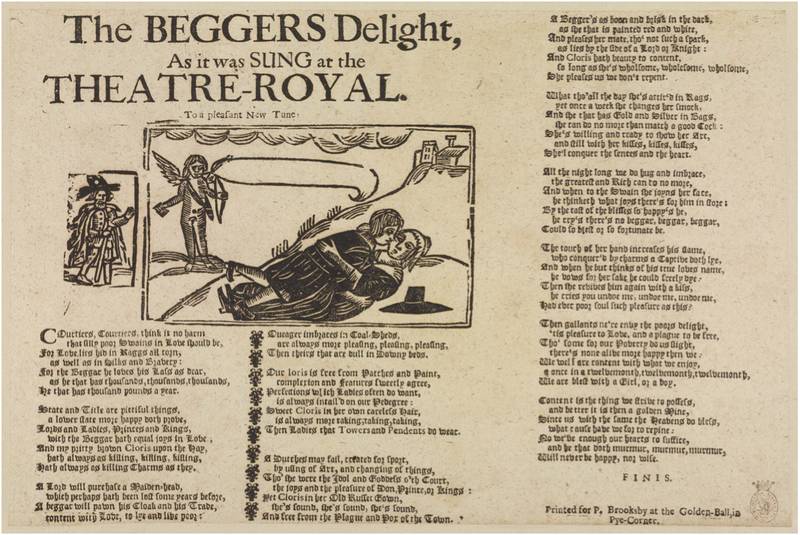 As the Music Specialist of the English Broadside Ballad Archive, I am often charged with finding a tune to fit a ballad: a task that is sometimes straightforward, sometimes complicated, and sometimes surprising. 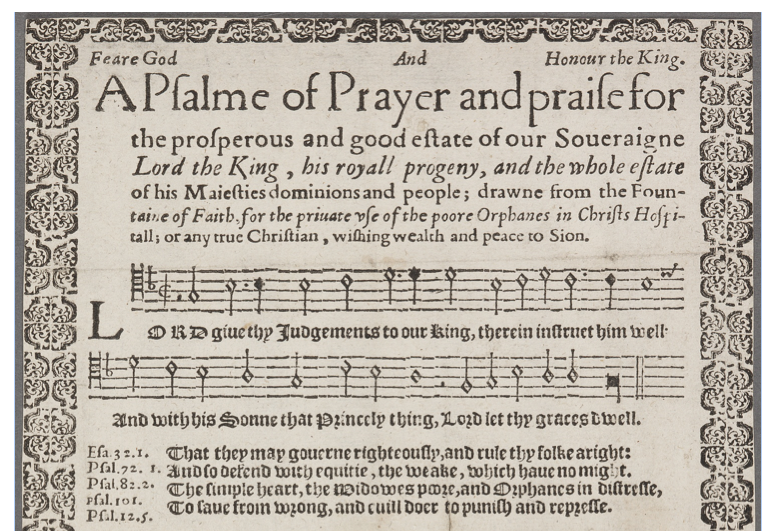 Many of the ballads found in our collections at the English Broadside Ballad Archive have been addressed by Claude M. Simpson in British Broadside Ballad and Its Music, and Simpson provides a good starting point for identifying the tunes to which individual broadside ballads were sung. We first search Simpson's volume for the tune title, ballad title, or a first line or chorus line in the index; from there, we expand on Simpson's research. Simpson's text is often helpful even if he does not explicitly mention the ballad we are researching because we can often find the tune through inferences in his research. As Skeaping suggests, then, first lines and refrain lines can often point to a title when no title is given. After identifying the tune title for a ballad, I next search for a reliable source for the musical notation for that tune. For the tunes he has researched, Simpson provides clear, unadorned transcriptions from original scores of the period. Some broadsides come with their own notation, such as Huntington 18331 (EBBA 32481), though this is rare. When neither Simpson nor the broadside sheet itself offers a transcription, I turn determined sleuth and the search for music notation commences. Librarians have been invaluable resources to me in this regard, as have old songbooks for piano, violin, or flute, or compilations of songs for the layman. Song collectors such as Steve Roud, writer and composer Thomas D'Urfey, publisher John Playford, and poet Robert Burns (who collected Scottish songs) have amassed volumes of airs and popular melodies. In an article for History Today, Skeaping explains how she discovers music notation for her recordings: “Even in the usual absence of any actual music notation, some tunes are relatively easy to trace, preserved in collections of country dances, in artful arrangements made for keyboard or viol consort, or in song anthologies like Thomas D'Urfey's three-volume Pills to Purge Melancholy (1719-20)." Fig. 2: "No 'tis in vain though I sigh and complain" musical notation, provided by Sandra Tuppen of the British Library (shelfmark: Additional MS 29396, folio 76v). 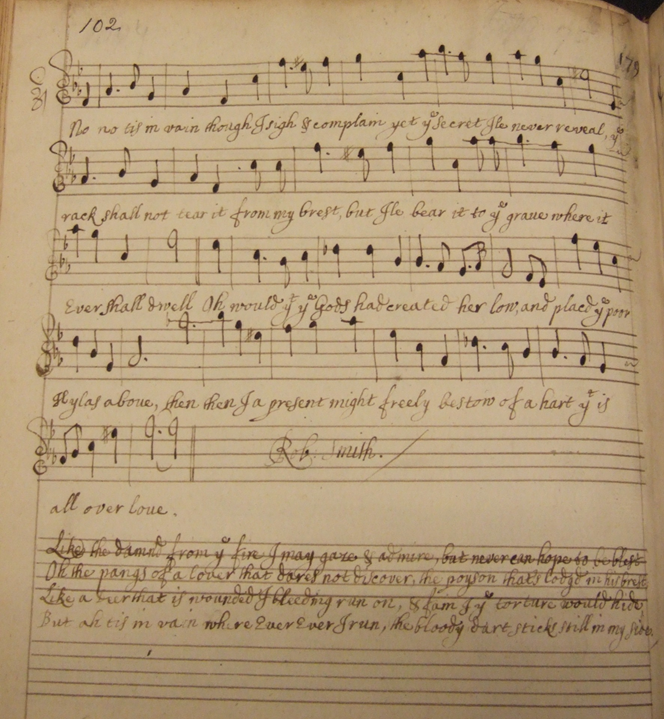 Here is our recording of Roxburghe 2.99 (EBBA 30565) sung to the musical notation above. Fig. 3: "Love is the Cause of My Mourning," as found in Atkinson Manuscript, a fiddle tune book from the late seventeenth century. In this way, when we find a tune for a ballad in the collection we are currently working on, that tune can be used for ballads in previous collections that we thought didn't have an extant tune. 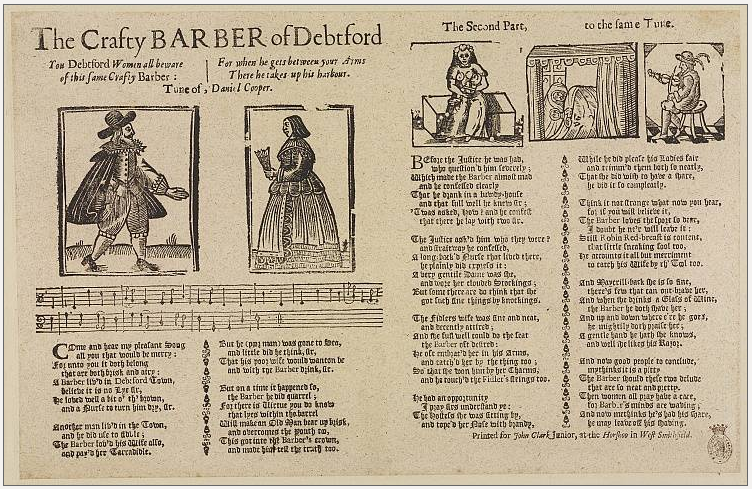 And so the discovery of a tune for one ballad leads to the discovery of a successful tune for many more ballads! This is always exciting. While researching for the Rare Books collection, I found the tune “Where Helen Lies” for the ballad Rare Books l.262 2 (EBBA 34089), titled “Where Helen Lyes.” I was then able to go back to a previous collection, Roxburghe, and use that tune for the ballad Roxburghe 3.578 (EBBA 31284), “I Would I Were Where Helen Lyes.” In fact, while researching the National Library of Scotland collections, I discovered that many of the ballads in our previous collection, Roxburghe, were Scottish and was able to match them with a tune. In the course of tracking down these tunes, I have found many new sources such as songbooks (like “A Collection of Scots Tunes for Violin or German Flute” by William McGibbon) and library databases such as those in the Vaughan Williams Memorial Library; I have made connections with librarians in the US, England, and Scotland. It has been a truly exciting and productive adventure. In my work for EBBA, I am responsible for matching ballads with alternate versions, or with identifying almost-identical versions of a single ballad in different collections, so that we know when a tune need not be re-recorded. The process is particularly complex because we rely on so many different collections (Pepys, Roxburghe, Euing, Huntington, Crawford, Rosebery, Rare Books, Houghton). One particularly useful outcome of this labor is textual: we occasionally are able to cross-reference ballads in order to fill in words that were missing from a damaged alternate. Pepys 4.253 (EBBA 21913), for instance, features a missing corner and is also missing a complete line of text (see below); Crawford 293 (EBBA 33570), however, though it features different woodcut illustrations, has most of the same text as Pepys 4.253: their titles, for instance, differ only by one letter, in the spelling of “Beggars.” Thanks to the Crawford version, we now know that the missing line in the Pepys version begins “content with Love, to lye,” and so we have re-recorded the ballad using the complete text found in Crawford 293, replacing an incomplete recording of Pepys 4.253 in which the singer had to hum the missing words. Pepys 4.253 was also smudged in the third line of the sixth stanza, but we were able to interpolate the words “a spark” from our Crawford copy. Other recently archived ballads provide missing words from older collections; Crawford 387 (EBBA 33120), for instance, provides words that were damaged at the end of all eight lines of the last paragraph of Pepys 4.186 (EBBA 21848); Crawford 758 (EBBA 33467) provides the words “trouble” and “bubble” that were missing from the end of lines in the last paragraph of Pepys 5.109 (EBBA 22372). There are many avenues by which we can locate the tune title and musical notation for a broadside ballad. Though we rarely find ballads that include their own musical transcription, we can regularly turn to Simpson's useful book, to prior knowledge of tune title variations, or to other resources such as old songbooks or song indexes created by collectors. To find a tune and to hear its pleasant fit is always deeply satisfying. Through the process of discovering tunes and connecting alternate ballad versions, we can fill in words that were missing in previously researched ballads, or find previously unknown tunes that we can use for ballads in previous collections. As more connections form between the collections in our EBBA archives, and as we learn more about ballads and their tunes, we are surprised by our discoveries and pleased with our results. 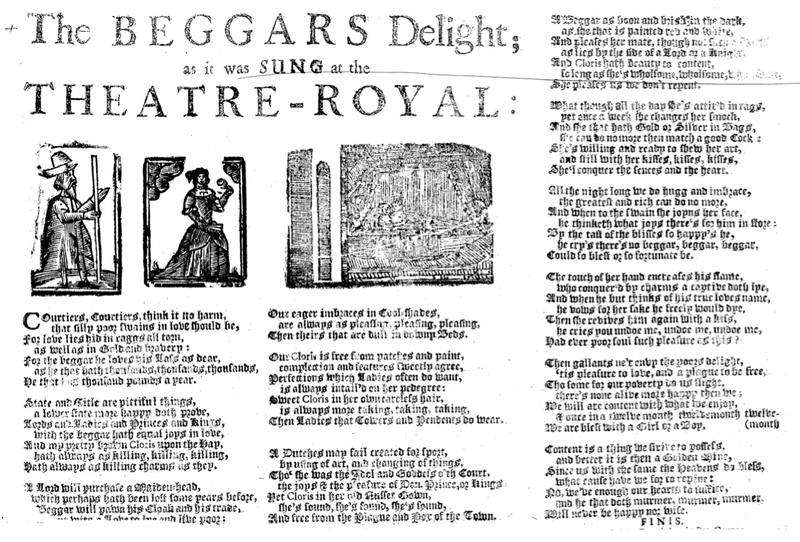 Discussion of "'To Its Own Proper Tune': Finding Tunes for British Broadside Ballads"
Version 4 id 917 of this page, updated 01 February 2016 by Lex Taylor. Created by Brian Reynolds.